Þann 27. september hélt ég svokallað “Lightning Talk” á ráðstefnu evrópskra upplýsingaarkitekta í Edinborg, EuroIA, og erindið var búddismi og notendaupplifun. Sumir lesendur kannast líklega við umfjöllun um efnið. Ég ætla að leyfa mér að gera undantekningu á blogginu og birta í fyrsta sinn færslu á ensku þ.e. lengri útgáfu af fyrirlestrinum. Ráðstefnan var haldin í níunda sinn í ár og en ég sótti hana í fyrsta skipti í Róm í fyrra. Innan tíðar mun ég skrifa færslu um það helsta sem ég tók frá ráðstefnunni. Bendi líka á blogg Martin Belam sem gerir ráðstefnunni frábær skil, m.a. stutt umfjöllun um mitt erindi. Meðfylgjandi er lengri útgáfa af fyrirlestrinum í textaformi. Það er virkileg áskorun að koma efni frá sér á fimm mínútum, í raun mun einfaldara að halda 30 mínútna erindi. Glærurnar segja ekki mikið en vonandi bætir textinn það upp fyrir áhugasama. Set fyrirvara um gæði textans á ensku. Bara mín brotna enska. This article is based on a five minutes lightning talk I gave at EuroIA in Edinburgh on 27 September 2013. It goes into a little more depth than the short talk. It’s about the link between Buddhism and user experience or broadly speaking the management of websites. I have worked in web management for over 16 years, thereof 10 years in the banking sector. I also teach web management at the University of Iceland. When I talk about web management it includes more familiar terms like information architecture, user experience, usability and content strategy. In smaller corporations, like most of the Icelandic corporations, staff take on different roles and have less specialization. For over twenty years I have been interested in religion and the impact it has own peoples decisions and lifes. I define myself as agnostic but with spiritual interest and for the past few years especially in the Buddhist philosophy. This article is not about religion. I don’t define Buddhism as religion but a philosophy and quite a pragmatic one. Everyone in the web industry is aware of how the web has become complex, with overflow of content, clutter and noise. It is in other words chaotic. Leaders in our industry advocate simplicity, focus and usability. Their message is clear. Make things more simple, reduce content and noise on the web so that our websites become usable. Gerry McGovern, author of Stranger’s Long Neck, tells us to remove 80% af pages of any website. As simple as that. Steve Krug, author of Don’t make me think, tells us to remove 50% of words on pages. And that’s not all, he says we should also remove 50% af the rest. So just leave one word out of every four. That’s a challenge! I ask myself, have those leaders run a corporate website and dealt with stakeholders? Have they dealt with lawyers in the firm? The CEOs? The marketing people? The engineers? The PR team? Have they? I don’t think so. Not at least in their daily work. I have been running corporate websites since 1997 and dealt with hundreds of stakeholders. All of them think highly of the content they produce. Almost no one believes it should stay anywhere else than on the homepage. And web managers want to be popular. Not hated is minimum. Just like anyone else. They want to have a nice job and leaving worries at the office when they go home. But it’s difficult to be firm and at the same time popular. Especially if we have to say NO to stakeholders most of the time. Only allowing them to have one page of content instead of five and this one page should only have 1 of every 4 words it had before. Insane! If web managers want to thrive in their work, they need a solid strategy or as I define it a web philosophy. It should state that we do not pollute our web with unnecessary content. Web managers need something strong to cling to when they deal with stakeholders. I have read loads of books by the experts in our field. I am influenced by many of them, Jakob Nielsen, Steve Krug, Gerry McGovern, and Eric Reiss to name few (I know! All white men above forty-something. Not intentional). The problem is that they have little hands-on experience in running corporate websites. But they are really good in telling us how to. And even if I tell myself and my colleagues those guys are all correct and we should follow their ideas, it is damn difficult. Because of the irritating stakeholders! So what am I implying? Is the solution to give web managers opium. A religion to soothe their misery and brain wash the rest of the corporation? Is that really what is needed? Now you may think, this guy comes from Iceland and thinks he is something. Having fancy volcanoes, the most innovative bankers, geysers and the cleanest air. But telling us that an eastern religion founded by some guy under a tree 2500 years ago is the solution to our problem? Think again. Well it may seem far fetched. But it isn’t. For me Buddhism, as mentioned, is not a religion. I like studying religion though. It’s my favourite hobby and has been for the last twenty years or so. And I’m not even religious and not heavily spiritual but I admit I like incents and meditating in the swimming pool. However I am fascinated by the impact religion has on people and society as a whole. Why do people do all these things in the name of religion? For me Buddhism is a philosophy and a damn good one. It’s practical and more or less about common sense. So Steve Krug is probably in agreement. It’s about empathy and calmness. So I guess Jakob Nielsen is fine with it. It’s about mindfulness, focus, to stick with principles and what really matters. So Gerry McGovern should be fine with this. Remember top tasks and long neck? It’s about simplicity, not complicating things. Make things usable, maybe Eric Reiss will agree? It’s about knowledge and understanding, we need to study our users and reach understanding. Almost everyone agrees with that I’m sure. Finally and most importantly, it’s about practice. To reiterate. 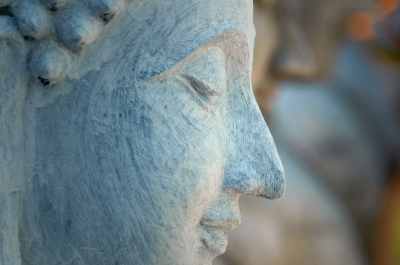 The essence of Buddhism can actually be summed up in two words: Practise Mindfulness. So I feel I have found a practical philosophy for web managers to adopt and make things easier at work. Make them feel better at the end of the day and eventually getting respect from stakeholders. Try it out for yourself. Don’t let me dictate your thinking. I am just giving you an idea.You may agree and you may disagree. But you can’t say I did not give it a try. Wish you and your clients all the best in running your future websites!